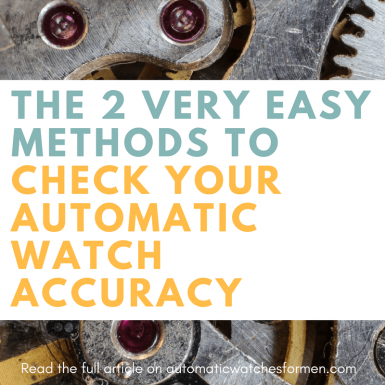 For automatic watch owners, I’m sure you’re wondering how to check the accuracy of the watch. It’s well known that automatic watch is not the most accurate watch around. An accuracy of +/- 20 seconds per DAY is considered normal. In comparison, quartz watch has multiple times of that accuracy at +/-10 seconds per MONTH. But alas, accurateness of the watch is NOT the main reason why we buy it, certainly not in this modern world where everyone is carrying a smartphone that will always display the most accurate time, every time. 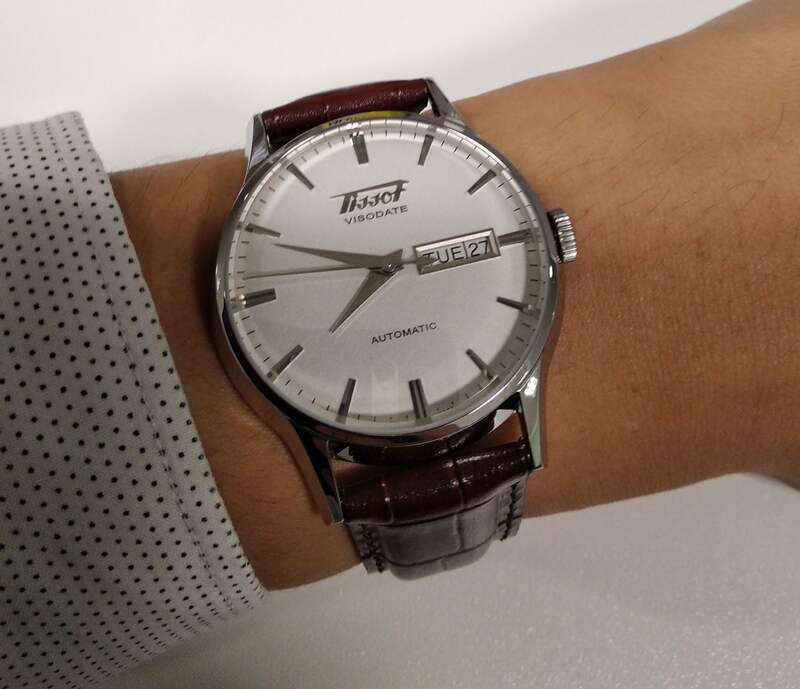 As a fellow automatic watch fans, I’m buying automatic watch for its unique trait, specifically the novelty of the mechanical movement that keep track of time without the use of any electrical and electronic parts. Unfortunately, it is this mechanical traits that contributed to the less accurate nature of the automatic watch. For me, accuracy of my automatics is not really important. But still, it’s nice to be able to know the accuracy of your watch from time to time. As I’ve mentioned in one of my latest post, by knowing the accuracy, we can assess if the watch is operating in its specification or it needs for an adjustment or service (in case the accuracy is very bad, like a few minutes per day for instance). Let’s get into the details of these 2 methods! The first method is to use a watch accuracy app in our smartphone. And no, please don’t pay for such app because it’s actually really simple (in fact you can do the calculation yourselves!). Personally, I’m using the WatchCheck app to do my accuracy check. It’s free, simple and easy to use. 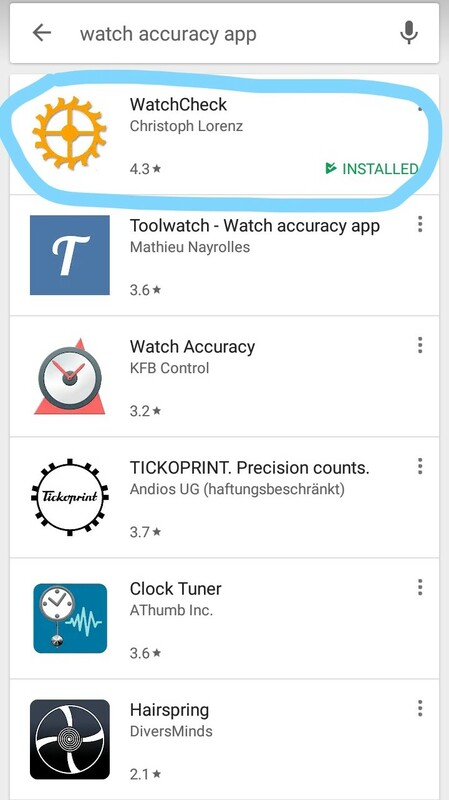 Just search for “Watch accuracy app” or “Watchcheck” on your google playstore and install it. 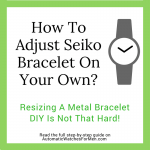 And this is the number one method that I recommend to that just bought their first automatic watches as it does not involve spending more money. I’d say it’s a semi-automatic way because we still need to manually track the accuracy day by day. But the app makes it easier as it will calculates the accuracy rate for us. Just download the app from your appstore and you’re good to go (I’m using Android but am not sure if the app is in Applestore or not. If you guys know if it’s available, do let me know in the comments section). First, we need to add a watch which is straightforward. Just enter the name of the watch, model (movement name?) and comments you’d like to put as remarks. The app uses 2 reference time for measurement which are NTP (Network Time Protocol or the internet time) and GPS (Global Positioning System time). You should only use NTP because its the internet time and in my opinion is more consistent vs the GPS time. But just remember to turn on your data while measuring the accuracy with the app. Overview of the page to measure the data. Just click the big green button to record the accuracy. The app will then calculate time difference between the watch and the NTP or GPS time for accuracy calculation. GPS time can be used when you’re out of network range, but I still prefer the NTP. As mentioned, using only one reference time is crucial as the measurement spans a few days to get a clear picture of the watch’s accuracy. The app works by matching the time of the automatic watch to the big digits on middle of the app. So if the time is 6:56, then wait for the watch to be at 6:56 and then push the green measure button. 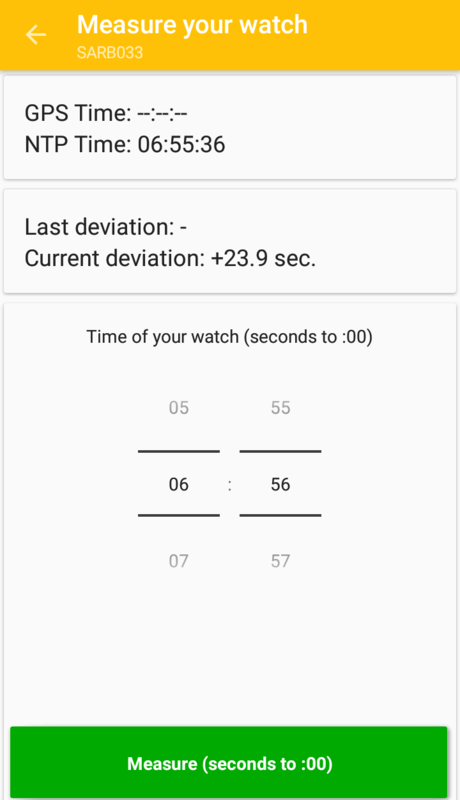 What the app does is calculating the time deviation of the automatic watch to the reference time in terms of seconds. We can better understand this by looking at the day to day readings. There are 5 columns in the data: Reference, Deviation (as mentioned above), Rate, Pos. (or position) and Temp. (or Temperature). After measuring the time deviation vs a reference time, the app can automatically calculate the accuracy rate in terms of +/-seconds per day. This is then stated under the Rate column. It’s a pretty straightforward math actually and can be done manually on a paper or spreadsheet if you like LOL! 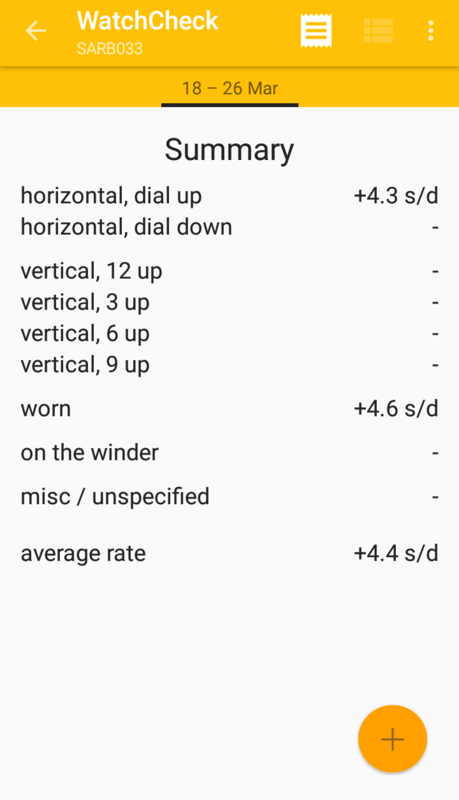 By the way, a nice feature the app has is we can input the data about the watch when the measurement was taken, specifically the position and temperature the watch was in. It is well-known that the position of the watch (dial up, dial down, used, etc.) can have an effect of the watch’s accuracy due to gravity. 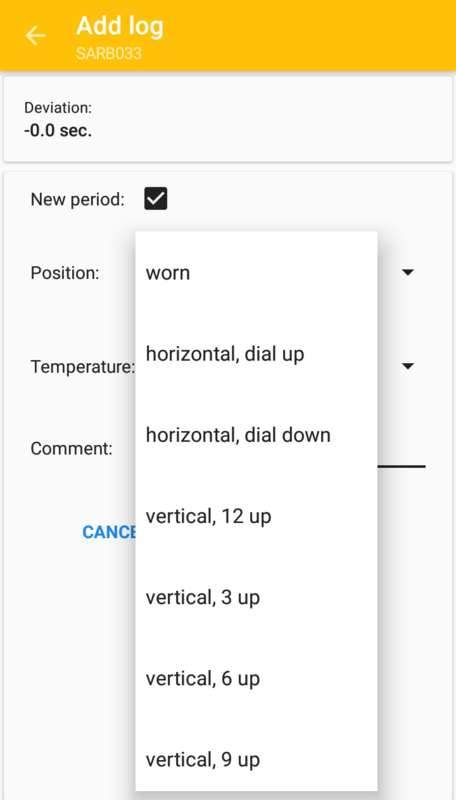 Above are the options on the data input for positions (worn, horizontal and vertical positions) and temperature (skin, 4/20/36 degrees) of the watch. Not only that, temperature can also play a part as the metal parts will expand or contract with high or low temperatures. By inputting these data when doing the measurement, we can get a better overall picture of the watch’s accuracy. For this, WatchCheck app has the summary sheet that precisely do that! An example of the accuracy summary of my Seiko SARB033. From here, I’ll be able to get the overall picture of its accuracy at a glance. For example, I know that my SARB033 is slightly more accurate when it’s laid down dial up vs. when its worn (4.3 sec vs. 4.6 sec). Create a new watch measurement log. Actually you can also do multiple accuracy measurements for a watch. Just name it differently such as SARB033#1, SARB033#2 and so on. For the initial measurement, I will reset the time of my automatic watch to the NTP. It’s actually not needed to do this because the accuracy rate depends on the multiple measurements but it’s just my personal preference. Besides, it won’t hurt for my watch to be accurate to NTP right? I’ll then use the watch for a day at work. At the end of work after I took it off, I do a measurement. 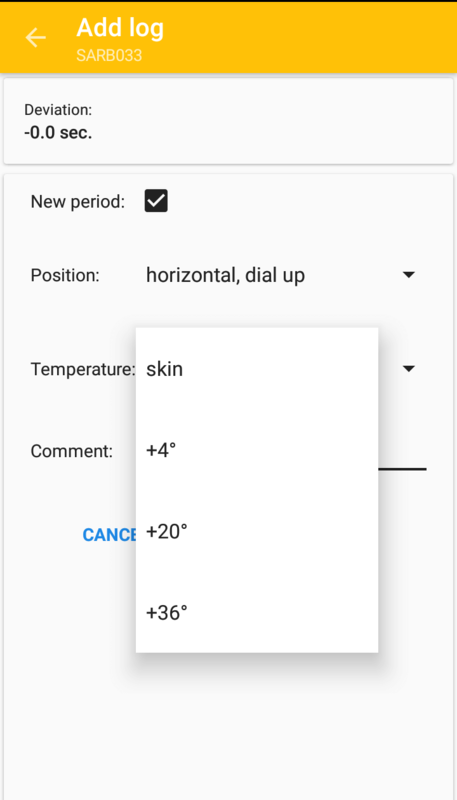 It the data section I put in “Worn” for position and “Skin” for the temperature. I’ll put the watch in my box with dial up after work. On the next morning before I wear the watch, I”ll do another measurement. This time I put in “Horizontal, Dial up” and “20 deg”. Of course, this depends on your actual temperature and how you store the watch. Then I’ll repeat the process for 5 working days. 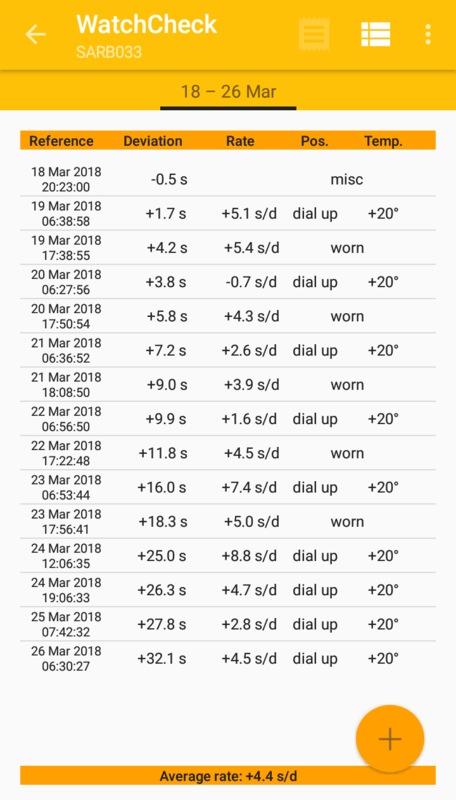 At the end of the week, I’ll have a good data with real life use exposure of the watch. Soon you’ll notice that the accuracy rate will go up and down depending on many factors. Some watch is more accurate when being worn while some is more accurate when not used. I have a Seiko 6R15 with great accuracy (the SARB033, the data shown above) and another 6R15 with not so good accuracy (the SBDC003, though to be fair it was roughly used for 3 straight years. Prior to that, it kept great time!). I also have an ETA 2836-2 with an average accuracy (Visodate) which is I believe was due to my lack of luck as most guys owning it reported a great accuracy. The second method is using timegrapher, which is what watchmaker uses (aka the professional way to get accuracy). 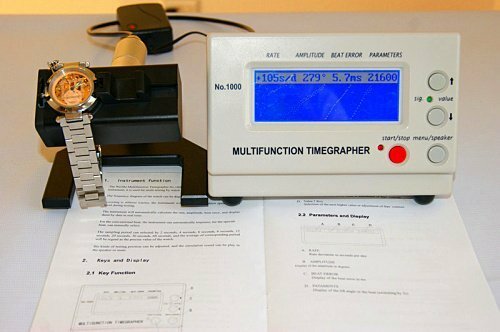 The major advantage of using this tool is the accuracy of the automatic watch can be known immediately, versus the lengthy method of tracking the accuracy day by day as in the first method above. We only need to put the running watch on the tool’s pedestal, and it will automatically state the accuracy rate, beat and amplitude of the balance wheel. The timegrapher is a nifty tool that allow us to know the important parameters of an automatic watch such as accuracy rate, amplitude, and vibration rate almost immediately. 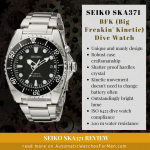 For the trained eyes, these information is very beneficial as they can quickly decipher if something is wrong with the watch and it needs service or not. Another cool thing is we can measure data when the watch is at different position by simply rotating the pedestal. So if you want to know more about your automatic watch than just its accuracy, investing in a timegrapher can be a good thing. Not to mention it’s a much cooler and faster way of getting to know your watch’s accuracy. If you’re interested in getting one of these timegrapher, click the link below to check out the best price on Amazon (disclaimer: it’s an affiliate link, which means I’ll be getting some commission if you decided to buy it). So Which Method Should You Use? So which one is the method that you use or prefer? Let me know in the comments section below! It’s actually really easy to know your automatic or mechanical watch accuracy by using above method. While it’s not exactly needed, it’s my opinion that by knowing the accuracy, we can get a deeper understanding of our watch. Not only that, knowing this info can be an indicator of an underlying problem with your watch. For example, a grossly inaccurate watch (more than +/- 30 seconds per day, depending on the movement specification) outside of the movement’s specification can means there’s something wrong with the watch and we can bring it for service. I hope you’ve learned about how to check your watch accuracy. Let me know if there’s something that you don’t understand. Till next time. There is (IMHO) better alternative to watchcheck. 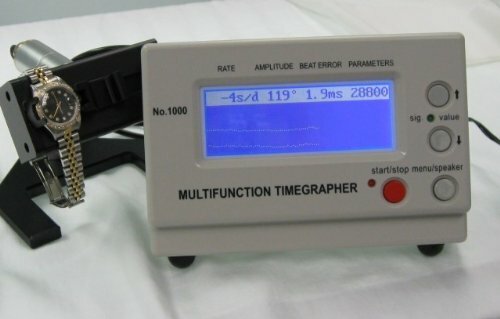 It is called “Atomic Clock & Watch Accuracy Tool (with NTP Time)” and provides quite similar functionality. Hi Tomas. Thanks for the suggestion and I will definitely check this one out. Any reasons on why you said it’s better than watchcheck? I think checking automatic watch accuracy is essential for many people like me since I also use an automatic watch for the novelty and it also looks cool lol. And it is a habit that I check my watch with it and not from my smartphone so it needs to be accurate. Thanks for the info and I will definitely implement the second method which I have never tried. Hi buddy. I’m glad that you find this useful. CHeers! Interesting I have never heard watchcheck app before, I will have to look into it, my watch always seem to be off and I would like to have the accurate time just because at work we have to be precise in the time we clock in for our shifts.